Newton Taxi Services, Inc. is known by most people in the community as the most reliable taxicab service that provide excellent service to the residents of Newton & Rockdale County Georgia and the surrounding communities. When you place a request for a pick up, one of the dispatchers will first ask you for your name, address and phone number to locate the nearest driver in your area.After providing these informations, the nearest driver in your area will call you at the number provided to inform you of his or her arrival time. Feel free to call us either for a price quote or a pick up request. Yellow-Cab Newton Taxi Services, Inc. is open 24/7 to serve you. We value and aprreciate every fare. No matter where you want to go just give us a call, out of town or just around the corner to grab a few groceries? Do not hesitate calling us. Our drivers are dedicated, and knowledgeable with your area. Newton Taxi Services, Inc. does not pick up passenger in private vehicles. or makeshift taxi cab. If it is not a yellow cab that says Newton Taxi Services, Inc. with the phone number 770-787-9330 then, It's not Newton Taxi Service. All of our big yellow vehicles are wired with gps and electronic meter that determine the cost of your trip. Remember, all local fares to & from Newton & Rockdale Georgia is charged by electronic meter only. All long distance fares are negotiated on a flat rate basis. Don't get over charged for your taxi ride. 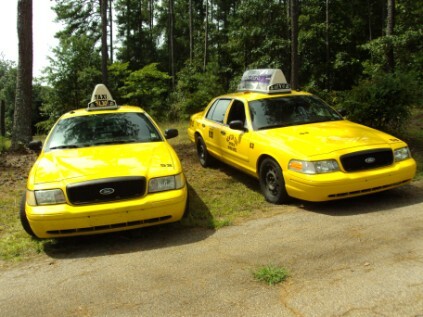 You will pay the right price when you call Newton Taxi Services, Inc. at telephone number 770-787-9330. Remember, when you call Newton Taxi Service directly, we'll make an effort to pick you up within just 15 minutes from the time you request our service. For all scheduled pick up, our drivers will attempt to be in your driveway 5 to 10 minutes ahead of time. Once again, Thank You for Choosing Newton Taxi Services, Inc.